Ever thought of leaving your 9-6 job and working from your own comfort zone? Or maybe traveling to one of those islands in the Mediterranean and working from that sea facing balcony? Well, this ain’t just a dream. There are enough Bloggers, Content Creators and Affiliate Marketers doing this already. 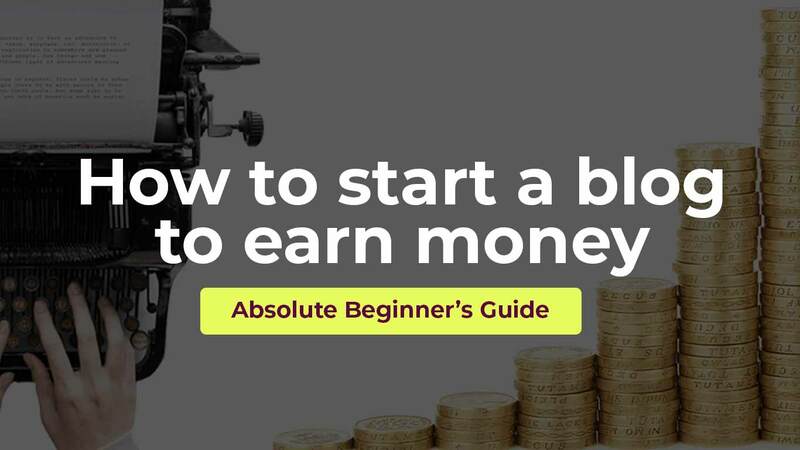 In this blog post, I’m going to tell you how to start a blog to earn money from it. Don’t worry even if you have zero knowledge about blogging. I’m going to explain this step by step. Before telling how you can start a blog and earn money from it, there are certain important things that I must tell you. This is not a get rich quick scheme. You can make money from blogging only if you are passionate, consistent and hard working. Many bloggers start making money only after 1 or 2 years of blogging efforts. They keep publishing blogs expecting nothing in return, at least for the initial couple of years. But as a blogger, you should be able to add value to your readers, that is where you win. You don’t have to quit your job right away and switch to full-time blogging. In fact, that would be disastrous. You can start a blog while you are working, and once it starts to generate a consistent income, you can leave your job and become a professional blogger. Note: This blog post is meant to be an absolute beginner’s guide. I have tried to explain everything from the very basics. Even if you are new to terms like domain, hosting etc. explanations are given in the coming sections. And I know this is a pretty long post, but feel free to scroll down and reread the various sections in case if you have any doubts. When it comes to blogging, there are two things that you can do. If you are a total beginner, start with a free platform. If you are quite good at writing and have already published a couple of blog posts elsewhere, you can actually move on and invest some money to become a ‘serious blogger’. To start with blogging, beginners have excellent options like blogspot.com and wordpress.com. 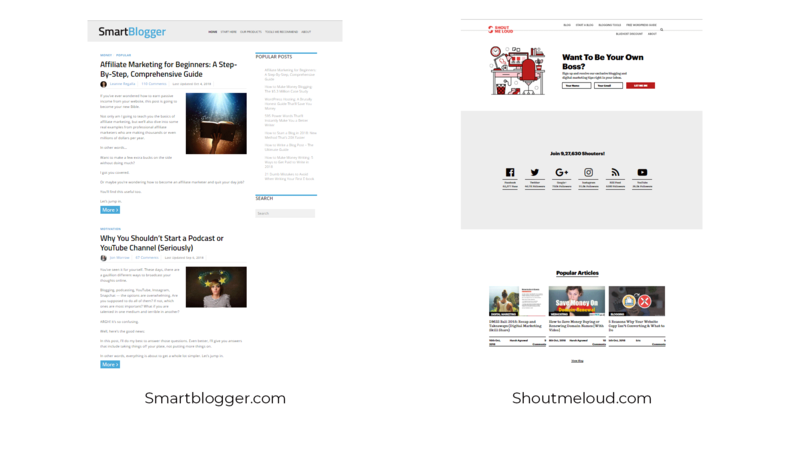 These are free platforms, where you can write and publish blog posts. You only have to create an account, and you are ready to go. But only thing, I would not recommend these free platforms to serious bloggers. Only because of the following reasons. 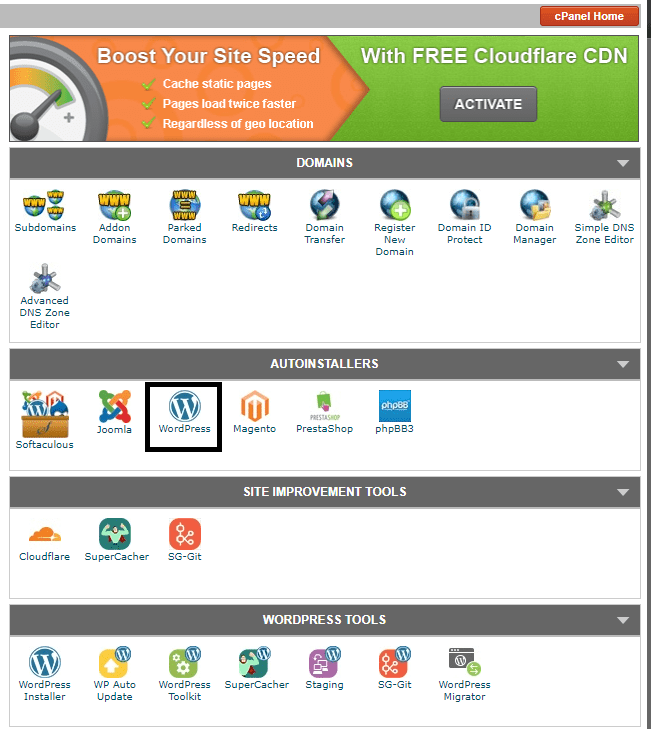 With a free blog on blogspot.com/wordpress.com, you have limitations in customizing your blog. You cannot change your theme or layout the way you want it to be. You can’t really place ads on your blog to earn money from it. With such a domain name, you will also have issues with building a strong search presence on Google. You cannot run affiliate programs with these free accounts. So if you are a serious blogger, and want to make some moolah out of your blog, read on. We are focusing only on a real blog here. One you can actually monetize and turn into an online business. I mean nothing created on blogspot.com or wordpress.com. Well, by paying some amount, you can get custom domains on these platforms. But even then, the blog will be hosted by them. You will not have any control over the hosting. A serious blogger should always have a ‘self-hosted’ blog. That means you will have to buy a hosting plan for your blog. For all this, we need to have a perfect blogging platform to start with. It is called WordPress, to be exact, it is wordpress.org. And I must tell you this. There is a big difference between wordpress.com and wordpress.org. WordPress.org is the self-hosted one, where you will have to buy a hosting plan to host your blog. Serious bloggers should really start their blog on a CMS (Content Management System) like wordpress.org. You can learn more about the difference between wordpress.org and wordpress.com here. I will tell you the exact step by step process in starting a blog and generating revenue from it. Even if you are a total newbie, this is no rocket science. But essentially, you should be patient enough to learn and apply these tactics while working on your first blog. Here we go with our first step in building a serious blog. Do you know what a ‘niche’ is? It is simply the topic or area that you want to write about. If you are good at Digital Marketing, you can choose it as your niche and start a blog on it. Ideally, you should be writing about something that you are good at. If you are good at gardening, start writing about it. Or if you are super interested in home décor and collectibles, start a blog on it. This is important because you won’t be able to give out genuine and valuable information to your readers if you don’t have in-depth knowledge about what you are writing. But here’s the thing, if your ultimate aim is to generate revenue from blogging, you better be picking up a profitable niche. Here’s a list of profitable niches in the blogging world. The two examples that we discussed above, gardening and home décor would fall under Lifestyle, if you ever had a doubt it. These niche blogs make money through ads, affiliate marketing, and even product sales. We will see all that in the coming sections. So, look out for that one niche you are super interested in, and you are really good at. Plus look for the ‘money-making’ aspect as well. Yes, your domain name is really important. Well, before we go further, if you don’t have an idea about what a domain or domain name is, here is the thing. Domain name is simply what you type into the address bar. See the below image to get a better idea. The ‘Extension’ shown in the image is also known as a Top Level Domain (TLD) and the ‘prefix’ part can also be called as a sub-domain. You can purchase your domain from a provider like Namecheap. Always go for a domain with .com extension. Or if you are focusing only on a specific country or region, go for a country-specific domain like .in (for India) or .ca (for Canada). Previously, people used to buy domains containing their target keywords to get ranked on Google without much effort. For example, in the earlier days, someone selling flower pots could buy a domain like cheapflowerpots.com and get it ranked on Google easily. The idea behind this is to turn all the people searching for the keyword ‘cheap flower pots’ into website visitors. Today, Google’s algorithms are so advanced and it doesn’t work that way anymore. Always go for a domain name that is brandable. The example that we just saw above, ‘cheapflowerpots.com’ cannot be a brand. Whereas domain names like lilysnursery.com or tomsgarden.com are always brandable. I am listing down the steps for buying a domain here. 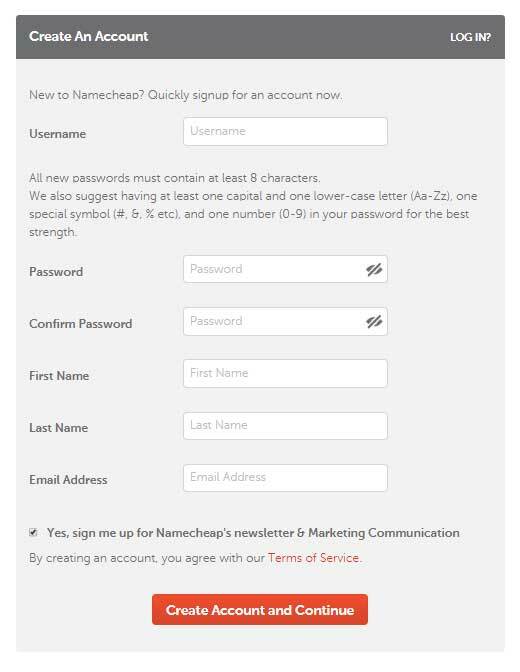 We are choosing Namecheap here to show the steps in buying process. 5. Create an account in Namecheap (if you don’t have one) and make the payment. That’s all, you’re done with getting a domain. You can see the purchased domain in your Namecheap dashboard. Namecheap is one of the top domain name registrars in the world. They often come up with some great deals on domain names. I have even bought .com domain names for less than $ 1 from Namecheap. So, if you have plans to get some really good domain names at cheap prices, Namecheap is the place to consider. Now that you have a domain. A domain is only an address to reach your website. To create a website, you need to find a space to host it. This is normally called ‘web hosting’. If you are a total newbie, you might find this confusing. But don’t worry, I’m going to break it down here. Just like how space is required to store your favorite movies and songs in your PC, space is required to store your website as well. But unlike movies or songs, your website will be stored on remote servers. To get a server space to store your website, you will need to buy a hosting plan. So that when people type your domain into their address bar, your website will be shown to them. There are different plans available like shared hosting and dedicated hosting. For beginners, a shared hosting plan will be just right. And even within shared hosting plans, you can either go for Linux hosting or managed WordPress hosting. The blog that we are going to create here will be running on WordPress CMS (Content Management System). So, getting a managed WordPress hosting plan is highly recommended, and I will also show you how to get one in this blog post. Before that, a bit about managed WordPress hosting. These are hosting plans designed for WordPress websites. With a managed WordPress hosting account, you will get one-click WordPress install, timely WordPress updates, automated daily backups, inbuilt caching and dedicated support. Though there are many providers who offer these plans, I would highly recommend going with Siteground. They are one of the best-managed WordPress hosting providers, in terms of performance and pricing. 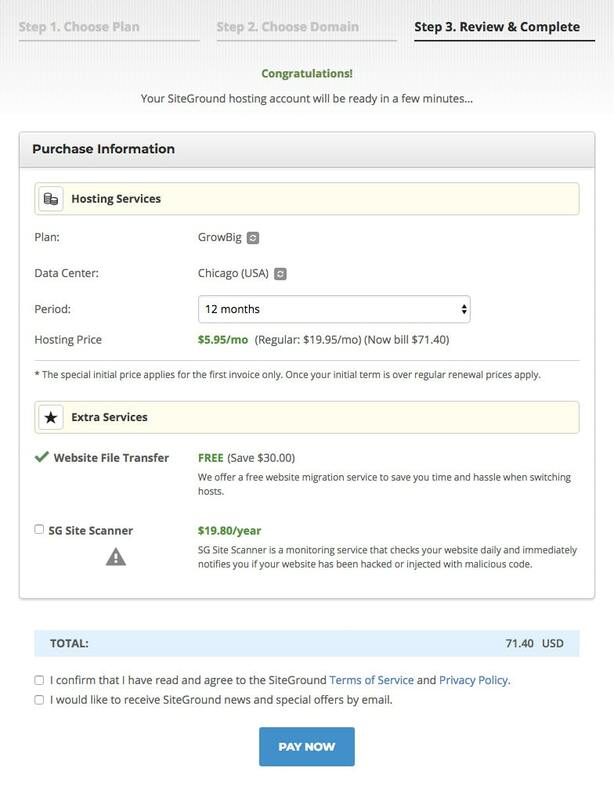 Below given steps will guide you through the process of buying and setting up a hosting plan with Siteground. 1. Go to siteground.com and click sign up. 2. Choose a plan that is suitable for you. For beginners, I would recommend going with StartUp or GrowBig plan. If your budget is flexible, you can go with GrowBig plan that offers features like inbuilt caching, free backup restores and free website transfer. 3. Add the domain that you have already bought. Once you have made the payment, your hosting plan is ready to use. Also, Siteground has a great support team available via chat, phone or tickets to guide you in setting up your hosting account and your blog. The next step is to change the nameservers in your DNS (Domain Name System) according to Siteground hosting. You will need to login to your domain provider (GoDaddy in this case) and make the changes in the DNS section to do this. The support team at Siteground will surely help you do this in case if you have any doubts. Now the only thing left to do is installing WordPress. Once WordPress is installed, you can start creating your blog. 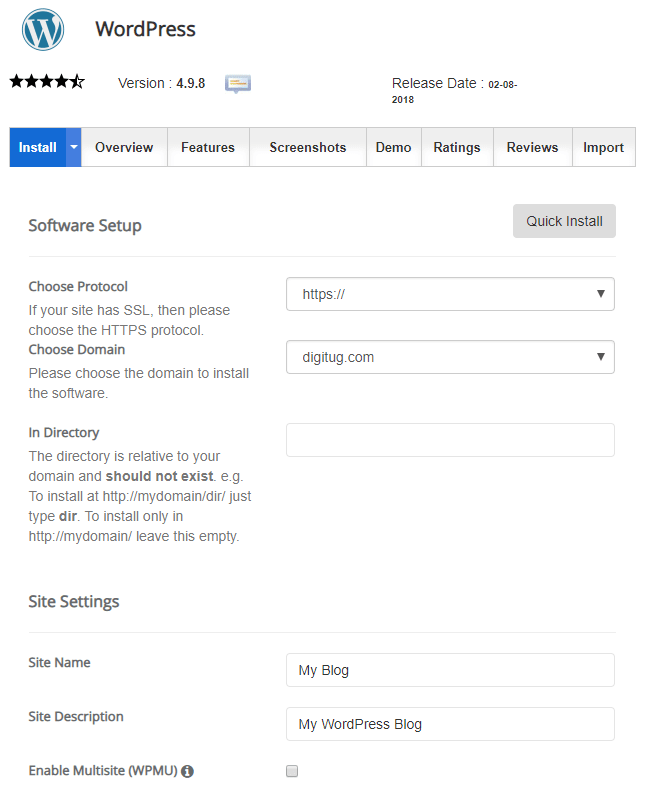 I am going to show you the exact steps for installing WordPress from your Siteground hosting account. 4. Click install now and enter required details. Certain details in the admin account section will be prefilled, and can also be changed if you like to. Once you are done with filling up the details, click the ‘install’ button at the bottom. Once you are done with these steps, you will be taken to the WordPress dashboard. There you can start creating your very first real blog. The next step is to log in to your WordPress dashboard and install a theme. 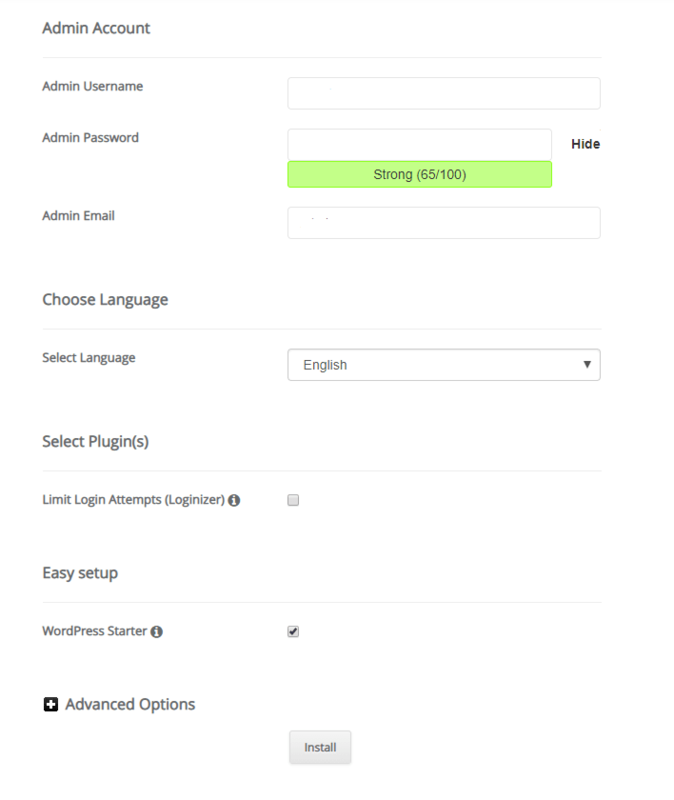 You can click the link to WordPress admin panel from your hosting account or just type your domain name followed by wp-admin (e.g. www.example.com/wp-admin) and enter your credentials there. After logging in, you can look for the ‘themes’ option in the WordPress dashboard. There are plenty of free themes available. But when it comes to customization options, free themes have limitations. If you want the full functionality of a theme, go for a paid one. Whenever I need to get a good WordPress theme, I visit themeforest.net. They have a tonne of premium WordPress themes to choose from. I personally use Osmosis theme by Greatives, and it was bought from Themeforest. Osmosis theme by Greatives also comes with plugins like WP Bakery Page Builder, which will help you create web pages easily without any coding knowledge. If you purchase a new theme, you will get the theme files in a zipped folder from the seller’s site. It can be uploaded as the zipped folder into your site from the WordPress dashboard. Screenshots are given below for a better understanding. Then create a child theme from the theme that you have purchased. You can keep both parent and child theme installed. Activate the child theme and make all the customizations on it. If you customize the parent theme, you may lose all the settings when a theme update occurs. Whereas if you customize the child theme, the customizations will remain in place. The update will affect only the parent theme. You can create a child theme with the help of a WordPress plugin called One-Click Child Theme or Child Theme Configurator. You can follow these exact steps to create a child theme from your original parent theme. Before building pages on your blog, visit a couple of good blogs and understand how they have organized the content. The homepage of your blog can be done in two ways. A dedicated page with basic details about your blog, services and maybe a little bit about yourself. A homepage showing all the latest blog posts. There is no good or bad type here, you can decide which one suits the best for your blog. The next step is to design pages. You can choose a plugin like WP Bakery Page Builder or Elementor to design pages for your blog. It requires no coding skills, some creativity is good enough. You can go through some of the existing blogs to get an idea about popular designs. And the tutorials on YouTube are really helpful. Here’s a detailed blog about how you can create beautiful web pages on WordPress using Elementor plugin. Get started with any of these plugins and you will do fine. But initially, it might take some time to get a hold of these plugins and their interface. Your patience will decide your success. Ensure you have the following pages on your blog. These are the minimum requirements for any blog to start with. Writing your very first blog post and publishing it on your blog is kind of a big deal. But you know what I did with my first blog post? I wrote a long 3000 words article. It was pretty good, with great examples and what not. But I did a mistake. I didn’t do any keyword research before writing that blog post. Eventually, people didn’t see it and I ended up with zero traffic from the search engines. It takes time to build search traffic, but even for a new blog, with proper keyword research you can bring in some traffic. Before writing your first blog post, do some keyword research and fix on your topic and the headline. Make use of this amazing Google Chrome extension (Available for Firefox as well) called Keywords Everywhere. It will show you the monthly search volume of each keyword when you type it into Google’s search bar. I’ll quickly say how you can do keyword research for your blog. There are other ways and tools to do keyword research, but this one is pretty quick. Decide on what topic you are going to write about and find out long tail keywords related to it. E.g. If you are writing about ‘digital marketing’, you can find out long tail keywords related to it. 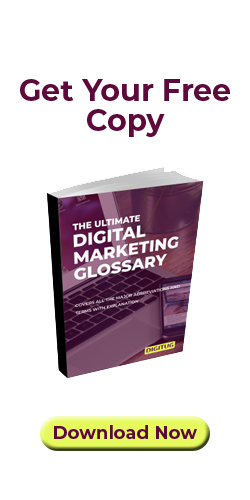 Some of them are; ‘what is digital marketing’, ‘how to learn digital marketing’ etc. Check for the monthly search volume of these long tail keywords using ‘Keywords Everywhere’ browser extension. Pick one keyword from the list of long tail keywords for your blog post. This will be your focus keyword for that particular blog post. Make sure this keyword has less competition and has a search volume between 20-50 per month (to start with your first blog post, especially when your blog is new). Note: This idea will go well only with long tail keywords with less monthly search volume. Such keywords will be easy to rank for, but will also depend on the competing sites and your content quality. Now, make use of the chosen focus keyword in your title and content. Also, do your on-page SEO based on this keyword. Apart from keyword research, the most important thing is content quality. To become a successful blogger, you will have to write super high-quality content that goes above 2500 words. Write articles that contain in-depth information, and are insightful to readers. The truth is, Google loves long-form content. So get ready with some great content to publish on your very first blog. This is the one phase where everyone struggles. You can build a great blog with an attractive theme and super quality content, but what if you don’t have traffic. People just won’t see your content at all. That’s why building traffic is important. Majorly, you can rely on three sources for traffic. Without a doubt, the best source of traffic ever is a search engine like Google. But getting ranked on Google takes time and effort. I would suggest all of you to learn the basics of SEO and start applying it on your blog from day one. It may not give you instant results, but you will see the difference in the long run. Check out these most essential on-page SEO tactics to be done on your very first blog. As a beginner, the one source of traffic that you can utilize most is social media. It will get you some instant traffic, unlike a search engine. Create accounts or pages for your blog on platforms like Facebook, Instagram, Linkedin, Twitter, and Pinterest. When I started my blog, I was already active on most of these portals with my personal profile. I made the best use of my personal profiles to share my blog content. As my personal profiles had a decent number of connections, it actually helped. In my experience, I see instant results whenever I share some of my blog posts on LinkedIn from my personal profile. Whereas there are people who get a good amount of traffic from sources like Pinterest. Either way, social media will be a great help when you rank poorly on search engines in the initial days. Another way to build traffic to your blog is paid ads. But is it really worth investing in these ads for traffic? If you are a beginner with less than 5 or 6 blog posts published on your blog, it may not be a good idea to go with paid ads. But if you make use of paid ads for gaining email subscribers or selling affiliate products, that might actually pay off, even if your blog is comparatively new. We’ll see more about generating website traffic when we discuss about affiliate marketing. I believe you have got some idea about creating a blog now. So, here’s the most interesting part; generating revenue from your blog. Majorly, there are three ways to generate revenue from your blog. Ads are a good way to generate revenue from your blog. The only thing is you need a good amount of traffic to your blog. The popular platform that will help you place ads on your website is Google AdSense. Google AdSense will show ads related to your content on your website, and whenever someone clicks or views these ads, you will get paid. Without a good amount of traffic, it is difficult to generate revenue from your blog using ads. This is because the amount that you get for each click on these ads are minimal. It can actually vary, but even then not all your visitors are going to click on your ads. The money that you make will depend on your CTR (Click Through Rate). For example, if 100 people visit your blog and just 3 of them click your ad, your CTR is 3%. So you will get paid only for those 3 clicks. The amount that you get paid for each click is called CPC or Cost Per Click. Also, the amount that you receive for clicks or views will depend on various factors including type of the ad, advertiser budget, and even your blog niche. I would say, if you have a comparatively new blog, monetizing from ads is going to be difficult. When you have at least 1000 unique visitors every month to your website, you can try placing ads on your blog. With a 1000 monthly unique visitors, even if your CTR is 3%, you will have 30 people clicking on your ad. And if your CPC is 0.1 $, you will get paid 3$ in total, every month. In the same way, revenue can be measured using CPM (Cost Per Thousand Impressions) as well. Another important thing is, Google AdSense is not the only platform that will help you place ads on your blog. You can try other services like Media.net and Propeller Ads. They work in the same way, but their terms and conditions vary, and make sure you are thorough with all that before placing these ads on your blog. You can learn more about placing ads on your website using Google AdSense here. The reality is, affiliate marketing works much better than ads when it comes to revenue generation from blogs. If you don’t have any idea about affiliate marketing, here is a simple explanation. It is just like earning a commission for a sale that happened through you in the real world. There are many networks and companies that offer affiliate programs online. You just have to promote their products on your blog, and if a sale occurs, you will be paid a certain percentage of commission. Mostly, these sellers will give you a link to place on your blog. When a visitor on your blog clicks on one of these links, he will be redirected to the original seller’s site. Where if a successful sale occurs, you will be paid the commission. You can place these affiliate links within your blog post, or even as banners or CTAs. Now there are different platforms that offer affiliate programs. You can either go for affiliate networks like Amazon Associates and Click Bank or choose an affiliate program run by a company that’s in your niche. In networks like Amazon Associates, you can find products from many companies to promote. For example, if you have a blog about health and fitness, you can promote books on the same topic and also promote health supplements from various companies. But when you pick an affiliate program by a company, you will be promoting only their product through that program. For example, if you are a Go Daddy affiliate, you will get to promote only their products through that program. Mostly exclusive affiliate programs pay better commissions than affiliate networks. And importantly, there are certain things that you should keep in mind before joining affiliate programs. Promote products that you have personally used and found useful. That way you are helping your readers solve their problems. Disclose affiliate links: tell your readers that you will be making a small commission if they click on your link and make a purchase. And also tell them they won’t be charged anything extra for the commission that you make. Most importantly, promote products that match with your niche. Don’t promote a health drink on a home décor blog. And just like ads, you need some traffic to make money out of affiliate marketing. But unlike ads, the return that you get from affiliate marketing is pretty impressive. You can rely on search traffic, social media and paid ads for traffic to your affiliate blog as we discussed before. In case of an affiliate blog, obviously the best strategy is to build a super strong organic search presence. But as you know, it doesn’t come quick and easy. Well, there are many affiliate marketers who manage to make good sums without relying on search traffic. They do it mostly through paid ads. And honestly, you can’t rely so much on organic traffic from social media for affiliate marketing. This is because the traffic from social media is more like spikes. You will see a surge of traffic right after you share something on social media platforms, but it’s mostly gone after a couple of hours. So, the next best thing that you can do is, rely on paid ads. Yes, it absolutely works, but you should ensure a good return on investment. Facebook paid ads are a good way to drive traffic to your blog. Create a good blog post, add affiliate links, and then drive paid traffic on to that page. Never ever directly insert affiliate links on your ads, you will be banned instantly. Now, before trying out affiliate marketing for the first time, read as much as possible about affiliate programs in your niche. Look for affiliate networks and companies with decent commission structures. Make sure you go through all their terms and conditions before enrolling into any affiliate program. This is probably the best thing you can do with your blog. Yes, create your own products and services and sell it on your blog. It is truly the most profitable way of monetizing your blog. Even better than ads and affiliate marketing. Depending on your niche, you can create multiple products that truly add value to your readers. You can create courses, ebooks, checklists, and even webinars. Many bloggers start with ebooks. But make sure it offers so much value to your readers. 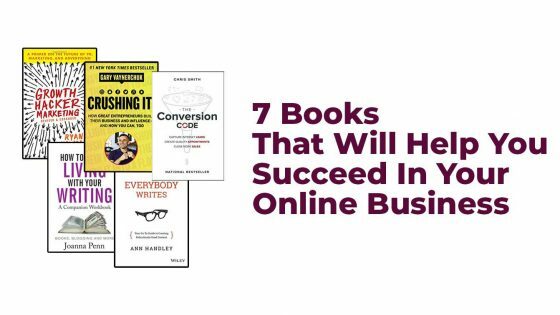 Ideally, they should be able to solve their real-life problems through your ebook. On your WordPress site, you can make use of a plugin like Easy Digital Downloads to offer the ebook as a download. You can also set up payment options with this great plugin. To target users in India, the best idea would be to use a platform like Instamojo for collecting payments and offering downloads. You can also place these ebooks for download on Amazon and offer a link from your blog to the Amazon product page. When you create own products, it is going to add to your ‘scalable income’. That means, once you put some great effort and publish an ebook, that is going to be there for a long time in the market. Each sale of that product after the launch will bring you some fixed revenue. To put it straight, you don’t have to work continuously. You can create a product and receive the income for a really long period thereafter. Many budding bloggers start with offering services like consulting. It is a great way to start generating revenue even before you make some affiliate commissions. I got my first freelance project while I was working on my first blog post. Since then, I have had freelance works every other day. Once you offer good services to some of your clients, you can actually acquire more clients through word of mouth and personal contacts. Your blog will be the base of all this. It will help you get enquiries and showcase your expertise. So what are some of the services that you can offer? E.g. If your niche is health and fitness, you can offer consulting on fitness and weight loss or gain. E.g. You can always offer services like content writing, SEO, social media marketing etc. if your niche is digital marketing. E.g. In fact, you can make a good amount of money through training. One to one training programs are always in demand and the trainers are paid well. Again, this will depend on your niche. The truth is, you are going to fail miserably as a blogger if you neglect email marketing. As famous bloggers have always said, the money is in the list. Simply means, the number of subscribers you have in your email list will decide your success in blogging and generating revenue out of it. You can start with setting up a couple of opt-in forms on your blog. An opt-in form can be created to offer a free download like an ebook or a checklist. Your blog visitors will have to enter their email addresses and first names to download these freebies. Offer a freebie that’s just irresistible. Try to convert maximum blog visitors into subscribers by placing multiple opt-in forms on your blog. Then write to your subscribers through personalized emails. Ensure you have email content that is value adding and problem-solving. The best thing you can do is to start with a great welcome email right after they download your freebie. This will help you grab their attention into more of your content. Also, be sure to nurture your subscribers through weekly emails with content that can actually help them solve their problems. Of course you can sell affiliate products and own products to your email list. But a hard selling email to a new subscriber will be a bad idea. Nurture your email list and then segment the list based on engagement. Send them soft selling emails based on their engagement. Then, yes, you can give them some last minute offers to drive conversions in a sales email campaign. Even then, try to not sound spammy. Don’t give them a feeling that you’re here only to make money. Hope you are getting it. Also, the email marketing tools that you choose are critically important. Pick a tool that has options like opt-in forms, automation, segmentation and importantly good deliverability. I have personally used MailChimp for email marketing and found it to be a great tool. I have also heard Convert Kit is an excellent tool with good deliverability. 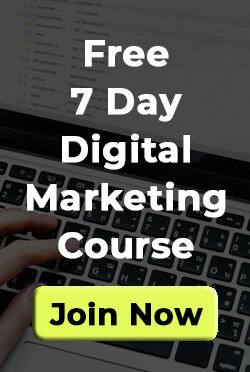 Still, if you are a beginner I would recommend you to start with a free plan of MailChimp and then scale up based on the number of subscribers. You can learn more about email marketing through other detailed articles and video tutorials before you actually try your hands on it. Just like any other trade out there, it takes a lot of commitment and hard work to find success in blogging as well. There are a lot of people who start blogging and then drop it midway due to various reasons. Consistency is kind of a big deal in blogging. Especially when you are on a job, it could be hard to find time for blogging on some days. But there is a little secret to overcome this. Okay, maybe not a secret. It’s called, work less – but never stop. For example, if you are dead tired after a long day, maybe don’t work or work for just half an hour. But don’t ever stop working on your blog for more than 3 days. I hope now you have got some idea about starting a blog and generating revenue from it. This blog post is meant to be a beginner’s guide. It can give you an overall idea about starting a blog, setting it up and generating revenue from it. But I would suggest you to go through detailed articles on each of these topics when you are about to start a blog of your own. Topics like affiliate marketing need a deeper understanding as there are many networks and companies offering affiliate programs. If you believe you can start a blog on something that you like, do it right away. You will certainly learn a lot of things as you go forward. Feel free to comment below if you have any queries or need any help. All the best for your blogging journey. Disclaimer: This blog post contains affiliate links. Which means if you click on any of these links and make a purchase, I will make a small commission out of it, at no extra cost to you. Thank you for your support.